Heralding The Satanist, the words “blow your trumpets Gabriel” bellow out from deep within Nergal’s gut and a moving sensation of defiance and intoxicating power takes hold. The mood is set and the black fire lit for the unveiling of what is undoubtedly one of the most anticipated albums of the year. Polish heavy metal extremists Behemoth unleash The Satanist; the band’s tenth studio album and a truly remarkable accomplishment. 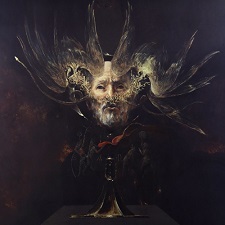 Behemoth - which is Adam ‘Nergal’ Darski (vocals and guitar), Zbigniew ‘Inferno’ Promiński (drums) and Tomasz ‘Orion’ Wróblewski (bass and vocals) – create something quite different with The Satanist compared to previous releases and, apart from the fact that it spawns tremendous results, the album simply feels very appropriate when reflecting upon both the span of Behemoth’s career and Nergal’s lengthy recovery from leukaemia after being diagnosed towards the end of 2010. There is an almost unnerving air of intensity that runs throughout the album’s 44 minutes – each song sounds primal and visceral; embedded between emotions that catalyse extremes of fear, revulsion, provocation and despair. The Satanist needs to be experienced, absorbed and contemplated. It is a colossal album in the sense of its raw power but it also demonstrates profound subtleties and allure. This contrast bares itself starkest at about midway through album. The second half of The Satanist, precipitated by the title track, is more provocative in its slower tempo and may draw a line between those who prefer the crushing power and intensity of the first five songs and others who equally appreciate the more ponderous elements to Nergal’s songwriting. ‘In the Absence ov Light’ is perhaps the song that will be referred to most in this regard but, it is hard to imagine anyone finding much to criticise here. Amidst the use of saxophone and a moving section where Nergal recites quotes in Polish from ‘The Marriage’ by writer and dramatist Witold Gombrowicz, Behemoth demonstrate a vulnerability that renders their music pulsing with a dark vitality. There is an incredible sense of cohesion between Nergal, Inferno and Orion on this album. It all appears effortlessness in how they each bring their own contribution to blend with the others’ only to result in the densest and heaviest of passages. If only but to mention one other song that stands out; ‘Messe Noir’ is a fine example of the band’s shared vision and hard work. Album number ten from the Polish metal legends is an almighty one. The Satanist is a triumph – extreme and dark death metal at its finest. All logos and trademarks in this site are property of their respective owner © 2019 The Metal Forge. All rights reserved. Content may not be copied or reproduced without the express permission of The Metal Forge. Material supplied to The Metal Forge online magazine is at the contributor's risk. Opinions expressed by interviewees published on The Metal Forge website are not necessarily those of the staff of The Metal Forge online magazine.